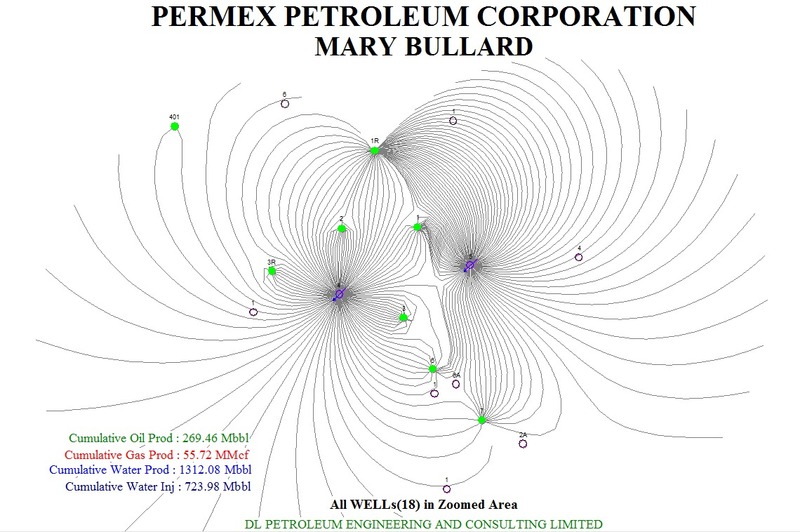 Vancouver, British Columbia--(Newsfile Corp. - September 6, 2018) - Permex Petroleum Corporation (CSE: OIL) ("Permex" or the "Company") announced today that it has completed Phase One of the Bullard Property Enhanced Oil Recovery ("EOR") Waterflood Modelling Project. The purpose of this report is to study the available production, injection and petrophysical data to determine how to optimize and restart this underperforming waterflood with the aim to rejuvenate and yield increased oil production. A study of the production and existing injector showed that water injection had a significant positive affect on oil production in the past with production of in excess of 100 barrels of oil per day within the Bullard field. The current injection in the reservoir is not employing efficient reservoir sweep nor is the Water Supply Well ("WSW") being utilized. The reservoir could benefit with new injection patterns perpendicular to existing flow trends. Re-directing injection will result with increased oil production provided injection patterns are properly managed with voidage replacement strategies. The reason is that the current injection channels have already created direct paths of least resistance to the various producing wells. The solution obtained from the phase one modelling project will change the injection patterns and 3 possible injector conversions are suggested for consideration. Through controlled injection planning, the data suggests that it is possible to change the swept patterns and increase overall oil production by maintaining balanced voidage replacement. The gathering and interpretation of these data points by the company's reservoir engineers will play a key role in implementation of the Enhanced Oil Recovery ("EOR") waterflood on this field. Permex President and CEO, Mehran Ehsan commented, "One of the criteria's we have for acquiring any mature, proven, producing asset is that there needs to be ample room to create secondary and tertiary recoveries such as waterflooding and in some cases CO2 injection for remaining oil in place. Given the fact that this field already has a proven and established oil reservoir associated with its past production, we are encouraged and reaffirmed by this extensive phase one engineering report and we are ready to start the implementation of the waterflood to achieve increased oil production." This press release contains forward-looking statements and information within the meaning of applicable securities laws (collectively, "forward-looking statements"), which reflect the Company's current expectations regarding future events. Statements in this press release which are not purely historical are forward-looking statements and include any statements that express or involve discussions as to expectations, beliefs, plans, objectives, assumptions or future events or performance (often, but not always, through the use of words or phrases including, but not limited to, and including grammatical tense variations of such words as: "may", "anticipates", "is expected to", "estimates", "intends", "plans", "projection", "could", "vision", "goals", "objective" and "outlook") are not historical facts and may be forward-looking and may involve estimates, assumptions and uncertainties which could cause actual results or outcomes to differ materially from those expressed in the forward-looking statements. Such forward-looking statements include, among others, the anticipated among others, the anticipated production of the field through an EOR, fluid recovery volume and oil conversion ratio.